I, like many of you… am in super organizing mode. The new year always deserves a fresh start and I am going through every room of my house purging all the clutter and organizing the rest. One way I try to tame what is left is to place the stuff into decorative baskets. I use them in my pantry, linen closet, office, and mud room. One of my favorite storage tips is basket lids. When I originally stacked the baskets they fell into each other and looked disheveled. By making basket lids out of cardboard and fabric, I created a way to stack basket on basket and still maintain order and beauty not only on my shelves, but as you can see from the photo above you can also make a unique nightstand or side table, too. The baskets have extra towels and things my guests may need. They not only look pretty, but they are functional as well. The basket in the photo below I got at IKEA. 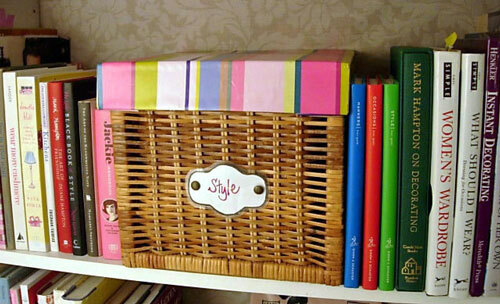 Other places to find square or rectangular baskets for stacking is at HomeGoods, Michaels and thrift stores. They also look pretty and add color and interest to a bookshelf. -You can fuse iron-on laminating vinyl to the fabric so it can be easily cleaned and dusted. -When using decorative paper, instead of fabric, the vinyl will adhere without the need of an iron. 1. Place basket upside down on cardboard and trace around perimeter with pencil. Add 2″ to each side and draw lines to show this measurement on the cardboard. Using a ruler as a straight edge, cut cardboard on the outer lines. 2. Line up a straight edge along one basket perimeter line and with an open tip of a pair of scissors; score the line all the way to the edge of the cardboard. This will become a fold. Repeat for the other 3 drawn lines. 3. Laminating the fabric or paper is optional. Following manufacturer’s instructions, laminate fabric or paper. Lay fabric on a table right side down. Spray wrong side with adhesive. Then center top-side of cardboard onto sprayed fabric. Use your hands to carefully remove creases and air bubbles. Once fabric is adhered all around, turn excess fabric over edges onto other side of cardboard making sure it is sticks. 4. Make a cut on score lines as shown. This will create corner tabs for gluing the box together. 5. Fold box top at score lines and carefully run a thin line of hot glue along the inside corner tab and attach to adjacent side to make corners of box. When glue has cooled, place on top of basket. Voila, you have a great stackable basket lids in your own style. For more organizing tips visit my Organizing Gallery. I just looked on Pinterest for a diy on basket lids and found this. Should have known to come here first anyway! Thanks. Your re-creations are so inspiring! I love what you did here with the basket lids. as well. I’m about 80% done with them and so far couldn’t be more happier with how amazing they look. I’ve started buying the hardware to accessorize them with-beautiful! My daughter says, the cabinets now allow other focal points (river rock fireplace and wood floor) near the kitchen to shine even more! My creative juices are flowing like a river now. Thanks! Hi Brenda – I remember the feeling I had when I first started painting my cabinets. I would just look at them so happy that I finally had what I wanted. I bet yours do look terrific with your wood floor and river rock fireplace (swoon) . Someday I would like to have a stone fireplace. Painting cabinets does take some effort, time, and focus – but it is all worth it when you are done. Thanks for connecting with me. I would love to see a photo when you are done. Oh MY GOODNESS! I need you to come live wiht me and organie my life! I will feed you! I love these ideas!! Happy Saturday SITS Sharefest Day! Hi Diane, Thanks for visiting my blog and becoming a follower! I fell in love with your baskets with the lids on them and bookmarked this page and became a follower! I can’t wait to make lids for baskets! Looking forward to many more ideas from you,and hope to start posting some more of my own soon. Hi, I followed a link to your inspirational blog. I am now a follower… Great Ideas on the kitchen. I too have builder oak cabinets and have been dreaming of how to change it up. Thanks for the great ideas, I have been looking all over your pages… Karyn. This is so simple yet the result is amazing. I love this idea. hey there! i have admired the basket with the lid since i started to follow you blog now i am thrilled to know how to actually do it! thank you!! !